The catastrophic Chernobyl disaster occurred on 26 April, 1986. Chernobyl, the nuclear power plant in Ukraine, is responsible for thousands of deaths, including large numbers of people suffering from premature cancers linked to exposure to the deadly radiation (The Chernobyl Disaster 2015). 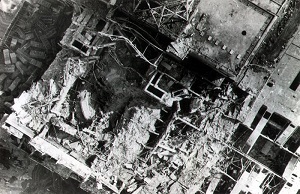 The accident occurred during an experiment to test a way of cooling the core of the reactor in an emergency situation (The Chernobyl Gallery n.d). The reactor design was flawed and was operated with inadequately trained personnel. A chain reaction began after the reactor vessel broke during a power surge. The resulting fire carried the radioactive material into the atmosphere and spread across a vast area. The extent of the radiation can be seen below. 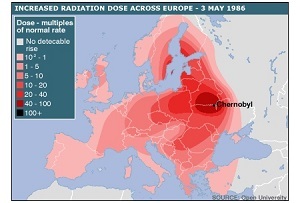 Radiation across Europe (Otro Mundo Es Posible 2015). Firstly, there was a deficit when it came to process control; partly explained by the fact that the plant was built for military purposes. It was designed to operate a constant loading in a plutonium production mode. Secondly, in the Soviet Union at the time the dominant philosophy invested faith in the worker - the operators in this instance (who unfortunately lacked adequate training). Automation was viewed with suspicion as it impacted on jobs (Chernobyl Did Not Need to Occur 2009). The reactor was to be running at a low power level, between 700 MW and 800 MW. The steam-turbine generator was to be run up to full speed. When these conditions were achieved, the steam supply for the turbine generator was to be closed off. Turbine generator performance was to be recorded to determine whether it could provide the bridging power for coolant pumps until the emergency diesel generators were sequenced to start and provide power to the cooling pumps automatically. After the emergency generators reached normal operating speed and voltage, the turbine generator would be allowed to freewheel down. Prior to the accident the operators violated the plant’s technical specifications. 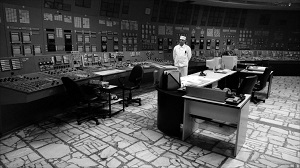 The operators ran the plant at very low power, but without following the safety procedures (Nuclear Energy Institute 2015). The reactors were unstable at low power, primarily owing to control rod design and ‘positive void coefficient’ factors. Without sufficient cooling for the reactors when the water levels dropped the nuclear chain reaction and power output accelerated. Consequently, these factors all lead to an uncontrollable power surge, which destroyed Chernobyl reactor 4. This created an immediate increase in heat, which shattered a few of the pressure tubes containing fuel. The hot fuel reacted with water and caused a steam explosion lifting the 1,000-metric-ton cover off the reactor. The pressure tubes ruptured causing a second explosion which exposed the reactor’s core to the environment (Nuclear Energy Institute 2015). The fire burned for 10 days. Deadly radioactive material escaped into the environment. Could this disaster have been prevented? If the process controls had been properly designed, the Chernobyl disaster could have been averted. Additionally, with more able and appropriately trained operators the outcome may have been less catastrophic (Chernobyl Did Not Need to Occur 2009). The International Atomic Energy Agency created a group known as the International Nuclear Safety Advisory Group. In its report in 1986 it supported the theory of operator error, “the catastrophic accident was caused by gross violations of operating rules and regulations” (INSAG safety report). Overall, this detrimental accident proved that a process must be understood before it can be controlled. The most experienced control engineers would all tell you this (Chernobyl Did Not Need to Occur 2009). Additionally, EIT’s Master of Engineering (Safety, Risk and Reliability) is an ideal gateway to boost your capacity to tackle these real world increasingly complex issues, specifically in; safety, risk and reliability. This carefully designed learning journey will develop factual understanding and also exercise participant’s creativity and design-thinking capabilities. Employers are hungry for these skills, and program graduates can expect a significant advantage when interacting with employers, clients, consultants and fellow engineering peers. 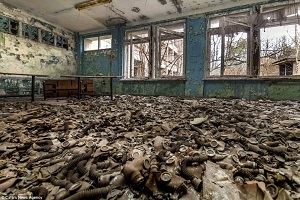 A sea of gas masks is left behind in an abandoned building (It Looks like our Planet after Humanity Disappears 2016). 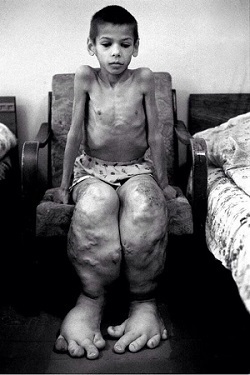 An innocent child who was affected by this horrific engineering failure (Chernobyl Disaster 2013). An abandoned park (World Remembers 30th Anniversary of Chernobyl Disaster 2016). Looking into the reactor (The Chernobyl Gallery n.d.). We would love to hear from you. Please send us your comments and/or personal experiences relating to this infamous disaster. Alvarez, B. 2015. Otro Mundo Es Posible. Avaialble. [ONLINE] Available at: https://www.otromundoesposible.net/contaminacion-radiactiva-incidentes-en-la-industria-nuclear/. [Accessed 4 March 2017]. Bogdan. 2015. The Chernobyl Disaster. [ONLINE] Available at: https://historyconflicts.com/chernobyl-disaster/. [Accessed 1 March 2017]. Liptak, B. 2009. Chernobyl Did Not Need to Occur. [ONLINE]. 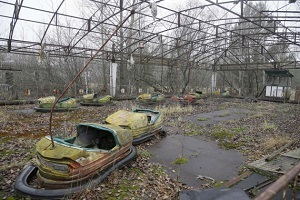 Available at: https://www.controlglobal.com/articles/2009/chernobyl0907/. [Accessed 20 March 2017].